If you use your Woolworths / WISH cards on the Woolworths Online website, be warned that if you partially checkout and then change your mind, you could lose the money that you've applied to that shop. Maybe it helps to take you through a scenario. 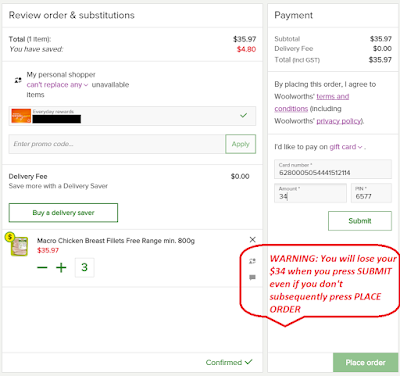 Let's say you order some meat online (eg $36 worth of Macro Chicken Breast Fillets Free Range min. 800g) and you click checkout, then you choose to pay $34 of it using your WISH card and you'll pay $2 more on credit card. You enter the gift card number and the pin, then you press SUBMIT. However, before you checkout and pay the extra $2 on card, you cancel the order. Maybe you change your mind to go to the store and get it. You've just lost $34 from your gift card balance. Surely in today's world, the system is able to recognise that your purchase didn't go through and $34 will be added back to your gift card? Wrong. 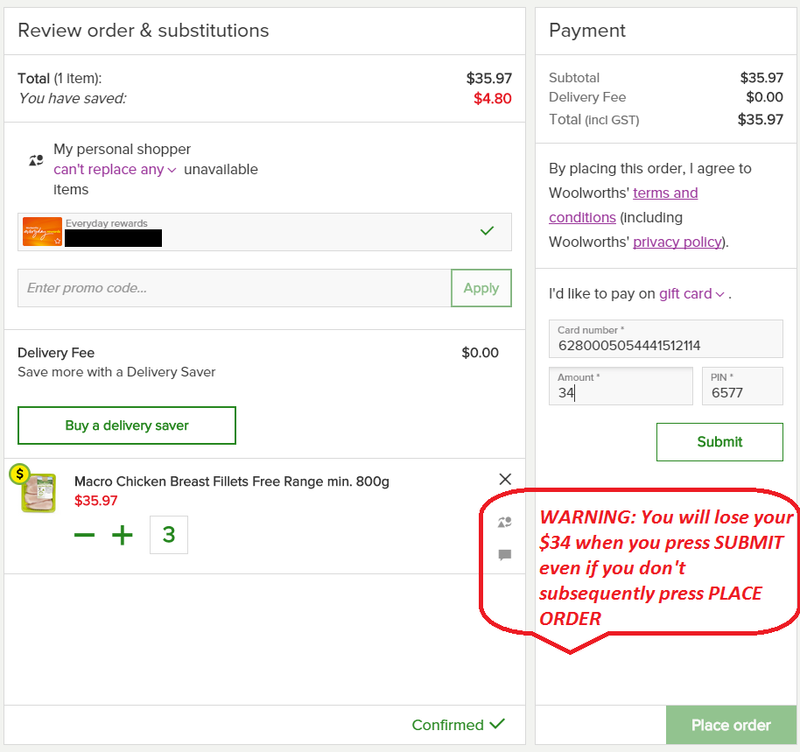 Or maybe the gift card system does not allow credit to be added back to the card, so that $34 will be there when you log back into Woolworths Online for your next purchase? Wrong. OK so maybe Woolworths will send you a friendly email telling you about how you've lost $34, so here's a voucher to the value of $34 to apply to your next shop? No, wrong again. You know when you go to a store and you drop a $2 coin in a crevice that even the store owner can't get to it. You've just dropped $34 down that online crevice and Woolworths will retrieve it later as an unspent gift card balance. So be sure you are ready to part with your gift card value when you click confirm because there is no going back, even though you haven't checked out. So... what should you do if this happened to you? Of course, there is one solution. Don't just take the hit. Call Woolworths Online and tell them what happened and they should issue you a voucher code to the value of the money lost (I would hope). Their helpline is 1800 000 610. This has happened to me. Called them up and they did issue a voucher code for the lost funds.